From June 16th to July 20th we have a display in the temporary Friends of Maidenhead shop opposite H&M in the Nicholson Shopping Centre. 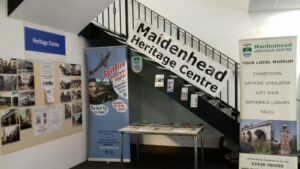 The display includes around 30 photos of “Maidenhead Past” as well as information leaflets about the Heritage Centre and all our activities. The Friends of Maidenhead shop is open on Thursdays, Fridays and Saturdays from 10am to 4pm. See you there!